Biomass heating is energy produced from wood, forest and mill residues and wastes. Modern technology converts biomass to heat, efficiently and conveniently. Modern automatic wood heating is mainstream across Europe, particularly in Austria, Germany and Scandinavia. 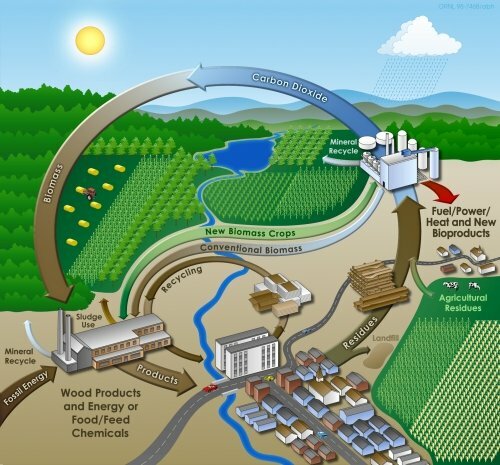 Wood and other biomass is a renewable resource which, as long as re-growth or replanting takes place, emits no net carbon into the atmosphere as growing biomass absorbs carbon. A community utilizing biomass heating systems provides a sustainable and clean approach that has the added advantage of stimulating forest management and local economies. Does using Biomass as a fuel damage forests? No! Common biomass heating fuels such as wood pellets and wood chips are derived from forestry and sawmill residues that by-products of the forestry industry. Previously these residues would either be burned or abandoned, but given the demand for biomass fuels are utilized to produce heat and energy. This means that no living trees are harvested solely for the production of biomass fuel. Particularly, the pine beetle killed forests in British Columbia offer a source of biomass fuel that could help stimulate damaged economies. Yes. Burning biomass returns CO2 that was absorbed as the plants grew to the atmosphere and releases the energy. Biomass is commonly stated as having no net release of CO2 if the cycle of growth and harvest is sustained (called carbon neutral). When biomass is used sustainably to displace fossil fuels in heating applications, the net impact over time is lower CO2 emissions in the atmosphere. Burning fossil fuels takes carbon that was stored over millions of years and releases it into our atmosphere as CO2 adding to the current carbon cycle. Burning biomass recycles carbon that is already in our carbon cycle; the net impact, no new CO2 released into the atmosphere and hence a carbon neutral fuel. How much maintenance do Biomass Boilers need? Depending on your biomass heating system, boilers need an annual service that normally takes around 2 hours. Evergreen boiler systems contain an ash box that needs to be dumped every month or depending on the use of your boiler system. A convenient ash removal light on the heating control module, lets you know when you need to dump your ash. How much ash is produced? As an example, the wood pellet boilers provide by Evergreen are over 93% efficient, converting the energy contained within the wood fuel into heat, leaving very little ash containing no combustible material. Around 5kg of ash should be expected for every 1000kg wood-fuel consumed. Ash is conveyed to removable binds via an auger. Modern wood heating is clean, efficient, convenient and cost effective. Modern boilers control the airflow, use thick boiler insulation and re-burn flue gases giving colourless flue gas and ensuring emissions that are well below even the strictest environmental standards. How safe are Biomass Boilers? Modern, sophisticated and fully automatic boilers are very safe and meet and exceed all safety requirements by the BC Safety Authority, TUV and CE. © 2018, Evergreen BioHeat Ltd. All Rights Reserved.